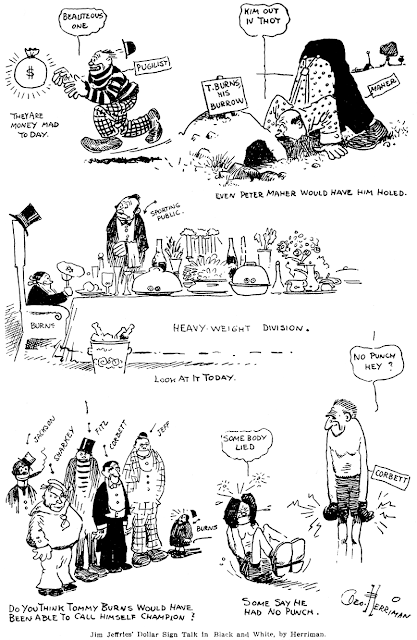 Sunday, October 11 1908 -- Herriman provides cartoon backup for an article by old-time boxing champ Jim Jeffries. In the article Jeffries shows disdain for the current crop of boxers, especially Tommy Burns. Though heavyweight champ Burns has been making mincemeat of all comers for the last couple years, Jeffries believes that he only fights easy targets. When Garry Trudeau put Doonesbury on a long hiatus starting in January 1983, it started an all-out war at the syndicates to see how many of Trudeau's newspaper spots they could poach. Some existing strips got catapulted into the national conscience, like Bloom County, and at other syndicates new strips were developed that they thought would fit comfortably in a Doonesbury-shaped newspaper spot. Editorial cartoonist Jeff Danziger and impresario Lew Little got together to enter the sweepstakes, and Danziger came up with what seemed like a natural. 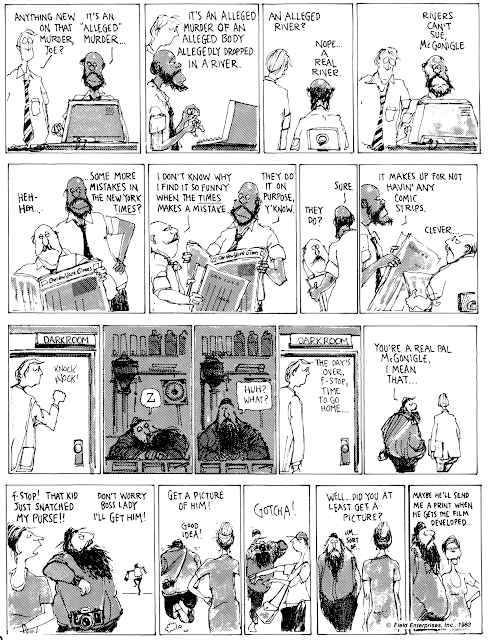 Set a strip in a newspaper office, where politics could be on center stage at all times. Populate the strip with a long list of characters, just like Doonesbury. When you want to comment most directly on current events, have characters sitting around watching the TV news. The strip seemed like a natural for the Doonesbury-starved newspaper reading public. 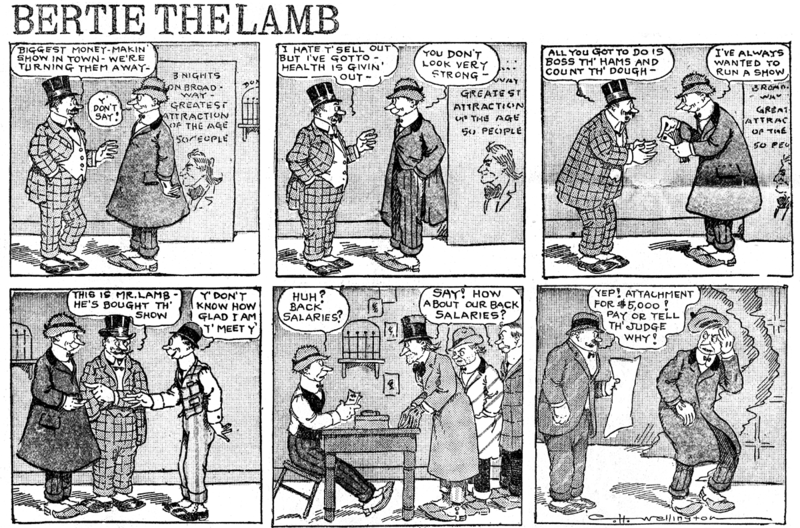 Lew Little presented the strip to the Field Newspaper Syndicate, and they evidently agreed that McGonigle of the Chronicle was a winner. The strip debuted on August 1 1983 in a modest but decent number of client papers. My thinking is that Danziger's strip was a little too scattershot out of the gate. With a list of recurring characters numbering over a dozen, readers needed a scorecard to keep them all straight. Whereas Doonesbury's cast had grown organically over time, Danziger was presenting the whole first, second and third strings all at once. It also certainly didn't help that the Field syndicate was bought out by Rupert Murdoch in 1984, putting the strip's distribution and marketing in flux. When Trudeau brought Doonesbury back in September 1984, there was an inevitable culling of the herd. Although McGonigle survived the initial attack, the wounds eventually proved to be fatal. The strip was ended on November 24 1985. 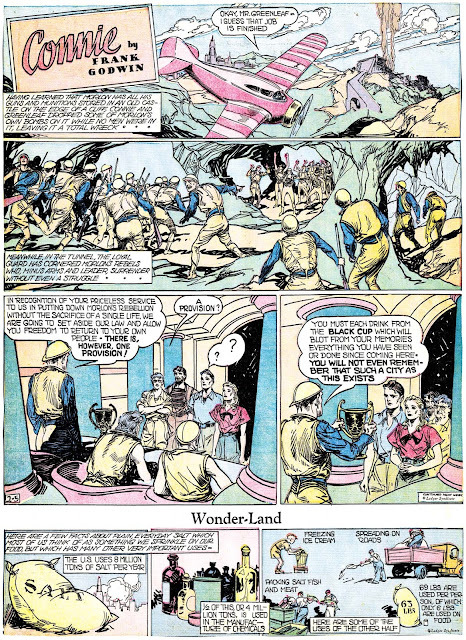 PS: while researching this post, I came across information that Danziger also has two local strips to his credit -- Out In The Sticks and The Teeds. If anyone has some definitive info on these (where they appeared, running dates) I'd sure like to hear from you. I have ordered a copy of what I gather is a Teeds reprint book ("Teed Stories") and hope that might shed some light. Perhaps another reason this strip didn't keep going was it never really got in many papers to start with. I can see the thinking, Danziger is very much a political cartoonist, on the left side, so you'd think he might fit into Trudeau's spots. Sometimes though, he could be far too aggressive about it, and sometimes just offensive. I always thought he was out on the fringe as far as being mainstream media material. It's acinch Murdoch wasn't exactly thrilled with him either, but having no sales made it easier to let McGonicle go. Incidentally- I don't know when the Sunday ended but i have files up to 29 December 1985. The daily definately goes until 18 January 1986, with an actual wind down story and finis strip. Thanks Mark -- do you happen to recall the paper that ran the strip to your end date? It's hard to gauge number of papers who ran a strip, of course, but my general impression has been that McGonigle started with a pretty healthy client list. If I had to take a wild guess, I'd estimate 75 papers at least. In addition to Doonesbury's return cutting into Danziger's list, I wouldn't be surprised if the rapidly advancing Bloom County poached more than a few of its spots. My notes say Out in the Sticks ran in the Burlington (Vt.) Free Press and "another Vermont paper". The Teeds, originally titled Teed Stories, ran in the Barre Times Argus and MAYBE in the Rutland (Vt.) Herald. The dates I have are really iffy. while Teeds dates from the 70s and 80s to at least January 20, 2008. No sources for any of the above, and take those dates with more than a grain of salt. If memory serves, the strip ran in the San Francisco Chronicle under the title "McGonigle of the Comical." A running plot was McGonigle's crush on his short-fused editor Suzie (seen here dealing with a bumper sticker placer). They had a first date; a few months later (presumably for the benefit of new readers) they had ANOTHER first date. I used to love McGonigle. I used to read it in the Miami Herald. 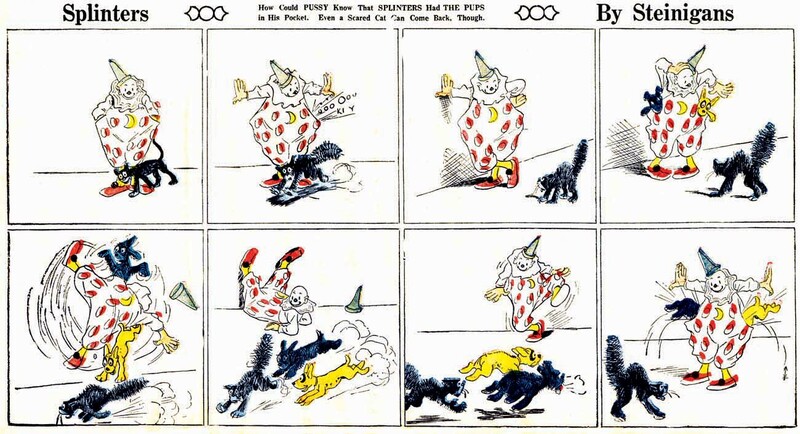 William Steinigans' favorite cartooning subject -- dogs -- is the subject of this simple and lively Sunday strip series, Splinters. Splinters the clown and his two pups were a regular feature of Pulitzer's Funny Side color sections from April 23 1911 to October 27 1912. The strip was also a semi-regular feature in the New York World's Fun magazine -- unfortunately there is no complete set of those magazines available as far as I know, so I can't offer running dates. After a wonderful start as a mostly pantomime strip, Steinigans soon found himself at a loss for wordless gags, so dialogue became the norm. That's a shame because these early examples above are a real joy to behold. Later strips are more ho-hum run-of-the-mill productions. You can see lots more of these over at Barnacle Press. During the great space race of the 1960s, Americans suddenly took a much greater than normal interest in the wonders of science and technology. Naturally this explosion of interest paved the way for a number of factual comic strips about science. The most popular was probably the excellent Our New Age, but there were others. One unlikely entry was Frontiers of Science, which was produced in Australia, initially for the Sydney Morning Herald. A daily strip that ran five days per week, it spent exactly one week discussing each given subject (like hurricanes in the above samples) and then went on to another. The strip was created and written by the team of Professor Stuart Butler, a theoretical physicist with a lifelong interest in making science accessible to the man in the street, and journalist Bob Raymond. Cartoonist Andrea Bresciani handled the art chores until sometime around 1970, when David Emerson took over those duties. Since the artists did not sign their work, and there are a lot of conflicting versions of the timeline, don't bet too much on that 1970 switch date. After its Australian debut in 1961, the strip was soon offered for international syndication. It was snapped up by a number of international syndicates, and for US distribution by the Los Angeles Times Syndicate. The LA Times-syndicated version was offered here starting January 1 1962, where it met with modest success. Worldwide, however, it was claimed that the strip ran in anywhere from 200 to 600 newspapers, depending on whose version of the history you believe. Either of those numbers, if true, are impressive for a comic strip of this type. As with most pop entertainment about technology, Frontiers of Science tended to overstate reality a little in order to impress the audience. 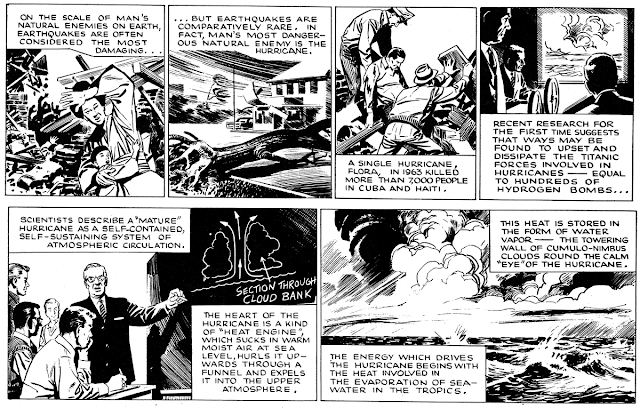 It wasn't unusual for the strip to claim that important technological advances were right around the corner, like the 'hurricane collapser' discussed above. That minor quibble aside, the strips were apparently considered worthy of being used in schools, as a series of four books of the strips were published in the 1974 Doubleday Illustrated Popular Science series. The series seems to have ended in the US on April 27 1979. Histories of the strip around the web contend that the worldwide end date is anywhere from 1979 to 1988. There's even one that says the strip was revamped a little and ended up running well into the 1990s. 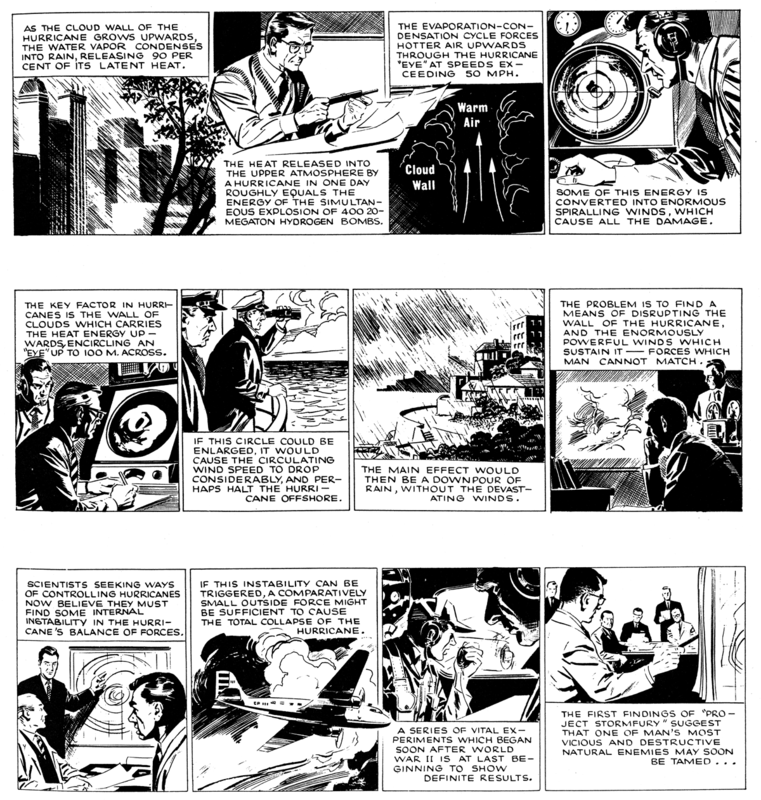 The University of Sydney website has an extensive archive of the Frontiers of Science strip, along with bios of the creators and a history of the strip. I have one of those Doubleday books - never knew where the strips came from, now I do! Thanks for the information. 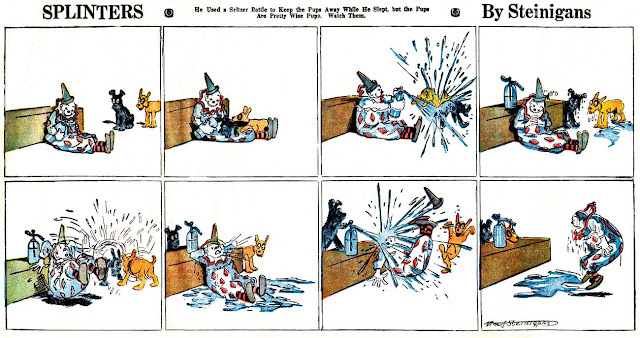 Here's a daily strip that only lasted a month, and a short month at that, back in 1910. Bertie the Lamb, about a poor sap who is constantly taken in by sharpies of various sorts, was penned by C.H. Wellington as sort of a 'flavor of the month' in the New York Evening Journal. The strip began on the first day of February and ended on the last. This sample is actually taken from an appearance in a rare July 1910 issue of American Weekly, which ran a few strips on its back cover in those early days. I presume they were all reprints getting a second run. 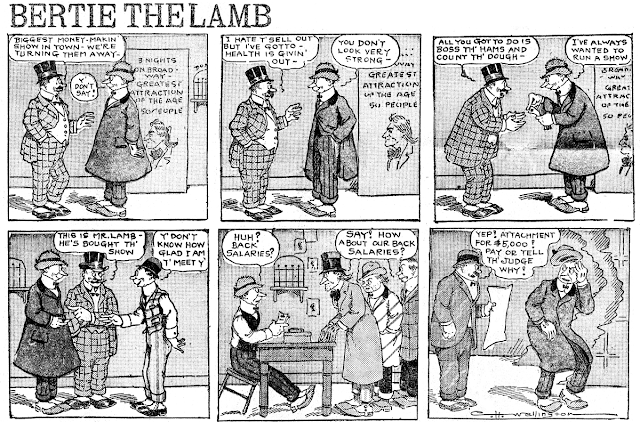 Interesting.. "Bertie the Lamb" was the name of Buster Keaton's hapless dupe in his first feature, "The Saphead" (1920), based on the Broadway play that starred Douglas Fairbanks in the role. A common slang nickname for easy marks, perhaps?